So, this is a bit of a treat: the eighth movie in the long-running Saw franchise – which is back after a seven-year absence – as reviewed by someone who until now has never seen a Saw movie in their whole lives. Now, I am definitely aware of certain aspects of it, like the traps and that creepy puppet and that suspenseful theme music, but ironically that’s more through its exposure in the media rather than actually watching the films themselves. From what I hear about it, however, it’s a brutal and highly gory series of movies that certainly have their audience locked down – otherwise, why would there be eight of these films in the first place? – and provide some sick thrills for them to munch down on their popcorn to. 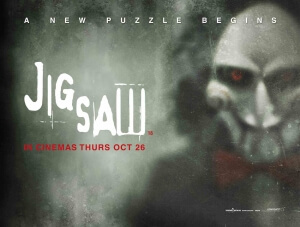 Going just by Jigsaw, to date the only movie in this franchise I have seen in its entirety, I can definitely see the appeal, but it might just be a little too ridiculous for my tastes… that said, however, I was never bored during this, especially at seeing how far the filmmakers could go in showing as much sadistic violence as they could. To sum up the plot would be to literally incorporate years of backstory, which is information I just don’t have off the top of my head (and I don’t have the time nor the attention span to look it all up online). From a complete beginner’s point of view, I’ll try to sum it up as thus: there’s a serial killer known as the Jigsaw Killer, who puts his victims through traps they have to psychologically figure their way out of, but apparently he’s been dead for ten years. Nevertheless, more bodies have started piling up that link directly to Jigsaw, and so the authorities have to figure out what is actually going on, and if he somehow isn’t dead after all. In the meantime, there’s a group of new victims who have been placed in a barn and faced with a whole series of traps that could mean death or mutilation for each one of them unless they follow the rules of Jigsaw’s game. Again, this being the very first Saw movie I have seen the whole way through (after only seeing bits of trailers here and there, all of which I seem to remember blending together after a while), my opinions are a little odd in and of themselves. Part of me is thinking that this is one of the most ridiculous, over-the-top and nonsensical things I’ve seen in a horror film all year, but another part of me had an alarming sense of glee whilst watching it. As silly as it gets, which it certainly does and then some, I never found myself getting bored with it or just wanting to end like some of the much worse horror films I’ve seen so far in 2017. There is definitely a twisted sense of delight and creativity laid out in these traps, and the gore effects are pretty effective as well, particularly a final death scene which needs to be seen to be believed. Even when it suddenly shifts to that police procedural part of the film, there is still this unmistakable self-awareness that makes it far more entertaining than it has any right to be, even when they’re saying and doing all these outrageous things with a straight face. So, has this movie converted me into the Saw fandom? Not really, honestly; there are parts that feel a bit too ridiculous and obnoxious to fully get behind, and it’s convoluted to a point where I just couldn’t make sense of anything that was happening. But now having a peek into the strange world of the Saw universe, I can definitely understand why people have great fun with these movies, even though it’s just not for me, but quality aside I am at the very least glad that I, ahem, saw it. Jigsaw is a completely ridiculous and over-the-top slasher movie that makes little to no sense for any franchise newcomers, but fans of the Saw franchise will most likely feel right at home with this new entry.